SHARE THIS PHOTO & spread the word! REGINA – Today marks the end to stable health care funding with the expiry of Canada’s Health Accord which will lead to cuts of $1.1 billion to Saskatchewan’s share of Federal Government funding over ten years beginning in 2017. The Health Accord refers to legal agreements signed among federal, provincial and territorial governments in 2003 and 2004. It sets out a common vision for health care in Canada and guarantees stable federal health funding, escalating at 6% a year. The expiry of the Health Accord on March 31, 2014, means provinces and territories stand to lose a total of $36 billion over 10 years through cuts to the Canada Health Transfer. Without a renewed Health Accord, funding will be tied to economic performance and a province’s population, while current obligations to adhere to the Canada Health Act will be eroded. This sets Canada on a path towards inequality and privatization. 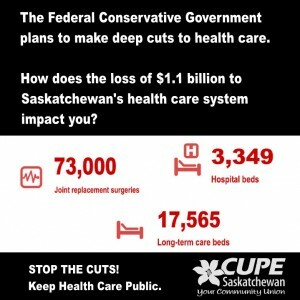 Representatives of Saskatchewan’s health care providers are calling on the Premier to urge renegotiation of the Health Accord to ensure Saskatchewan patients are protected from cuts, joining with others across the country on a day of action surrounding the expiry of the Health Accord. 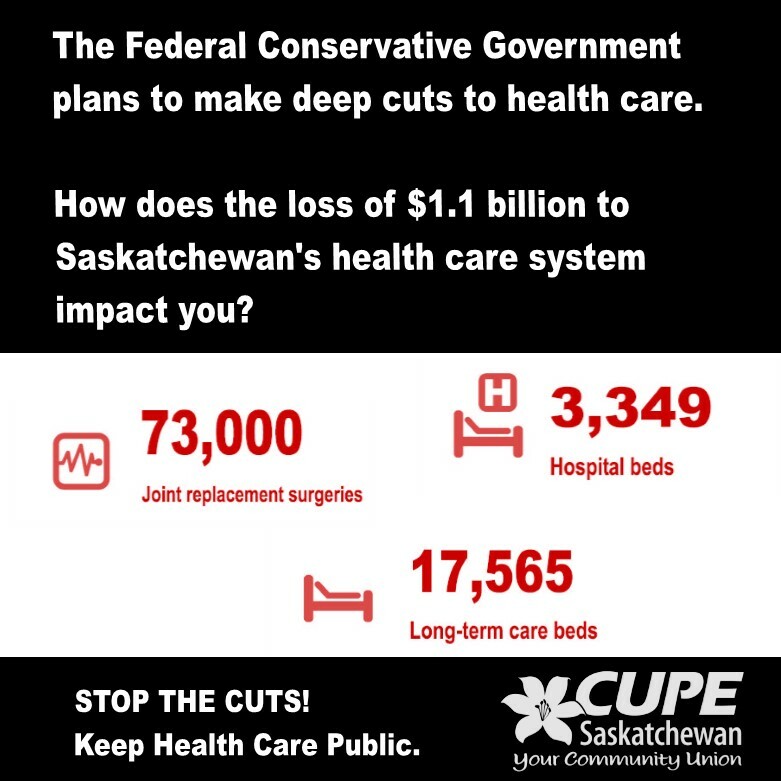 CUPE represents over 13,000 health care providers in Saskatchewan working in hospitals, long-term care, home care, community rehabilitation services and mental health services. SUN represents almost 9,000 Registered Nurses (RNs), Registered Psychiatric Nurses (RPNs), Registered Nurse (Nurse Practitioner)s (RN (NP)s) and graduates in the province.